Data Sharding – Another issue encountered with scale is the increasing load on DB servers. DB Servers do employ techniques like Master/Slave or Clustering techniques coupled with large powerful boxes but beyond 100+ million users, these techniques also fail. Further, the costly hardware and software licenses make the traditional DB options very costly. So, companies have used the MySQL as the base and created lots of solutions/topologies around the same. One of those techniques is data sharding. A Data shard is a horizontal partition of the data, meaning rows of the tables are held separately. There are numerous advantages to this partitioning approach. Since the tables are divided and distributed into multiple servers, the total number of rows in each table in each database is reduced. This reduces index size, which generally improves search performance. A database shard can be placed on separate hardware, and multiple shards can be placed on multiple machines. This enables a distribution of the database over a large number of machines, allowing database performance to be spread over multiple machines, greatly improving overall performance.Many new non-relational databases (commonly known as NoSQL databases) such as Cassandra, MongoDb and Hbase have been created with database sharding as a key feature. Bring Data closer to user (Caching) – Caching has been adopted and used very well by most of the Consumer Business Apps. Open source products like memcache provide caching options across the tiers (web tier/app tier and data tier). Memcache provides a reliable alternative to the traditional caching solutions – coherence, terracotta. Further, the NoSQL solutions employ the caching engine to speed up the database read and write operations. Couchdb uses the memcache to provide an in memory read/write solution. Service provider/consumer model – Another pattern that has emerged is the Service provider and consumer. It is derivative of the SOA model but leaner and simpler. The business functionality is exposed as a set of services via RESTful API with JSON data format. The presentation layers are the consumers that use these services to build up the user experience. The technologies to build the service and provider can be completely separate. Technologies are chosen based on what is best for the use case. Contracts are enforced by Service version and definition only. Front ends are typically built using PHP or Ruby over rails. Services are built using Scala, Akka, C++, Java etc. 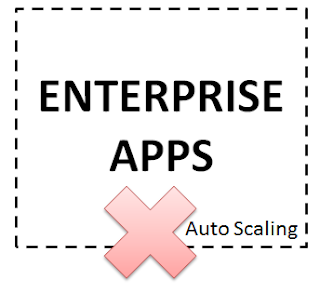 Why Enterprises are looking at these patterns?